Madeleine Albright is celebrated for many things, but fashion is not usually one of them. Albright, however, has been a trailblazer in one particular niche: Pins. Her new book, Read My Pins offers a detailed look at fashionable diplomacy. The book documents the same pins featured in an exhibition at the Museum of Arts and Design. The project is called Read My Pins: Stories from a Diplomat's Jewelry Box. Albright's extensive collection features around 300 pins, and while that does include a few expensive pieces, most of them are cheap, fun costume jewelry. The title is a play on George H. W. Bush's controversial phrase, "read my lips." This all started when I was an ambassador at the United Nations, Sadam Hussein called me a serpent, and I had this one antique snake pin, and so when we were dealing with Iraq, I wore a snake pin. And I thought, 'well, this is fun.' Then I went out, and bought a bunch of costume jewelry to signal what my mood of the day was. The serpent pin that sparked a trend in fashionable politics is featured on the back cover of her book. Albright has a lot of critter pins, and her collection seems to feature a disproportionate number of insect pins. She reveals that some bug pins were symbolic "protest pins." She wore a huge bertle pin after the Russians were caught taping the State Department, to send a non-so-subtle message about her anger. When she wanted to "do a little stinging or deliver a tough message," she chose a wasp pin. Butterfly pins meant the opposite, as did her hot air balloons. Albright also has several bird pins, some of which were gifts, some of which she gave as gifts. Apparently, choosing the right present for a foreign diplomat is a tricky thing, which requires a good deal of care. She says she tried to find "mementos that reflected the United States," like this gold eagle. She also wore an eagle pin to talk with Craig Ferguson, to reflect the fact that they are both naturalized Americans, "which makes us very patriotic." 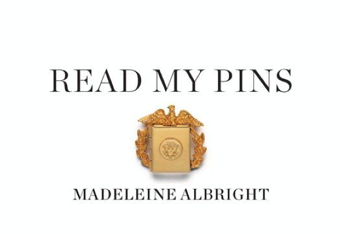 One of Albright's most notable winged-pins is a simple gold dove, given to her by Leah Rabin, wife of slain Israeli Prime Minister Yitzhak Rabin. She wore the "peace dove" to visit the victims of genocide in Rwanda. It can be occasionally maddening. As Secretary of State, you are actually doing very important business and delivering tough messages. But no matter what, people were concerned with what I was wearing, the level of my hemline. It can be kind of demeaning, depending on the situation. There are some people who wear them on the right side, some on the left side. Some wear them on their lapels. I keep wearing my pins higher and higher. It just goes to show what happens in diplomacy. I was visiting South Korea. There were always good relations and nice dialogue. But there was a Korean foreign minister who thought he was not on the record and was having some fun, and said that he loves it when Secretary Albright would come to Seoul because we had a nice relationship and we were about the same age, but he was like an old man and I was so vigorous and besides when he gave me a hug I had very firm breasts. All of a sudden there was this outcry over this and there were questions about whether would he have to resign for saying that. So they asked me what I thought, and I said, "Well, I've got to have somewhere to put those pins." So that helped, but the next time we saw each other, we shook hands at a very respectful distance, no more hugging. Another cool feature of the book is the "Pindex" at the back, which catalogs her numerous pins with page numbers and dates. But now that all of her pins are being displayed behind glass, Albright has nothing to wear. Fortunately, people have been stopping her on the street to give her "pity pins." "Yesterday, for instance, I was walking around and somebody gave me a pin that said, ‘Chicks Rock,'" she says, in an interview with the Daily Beast. "So, I think that's kind of fun."